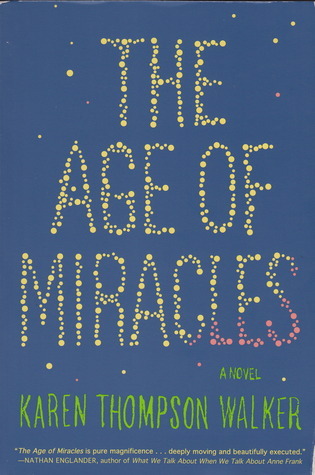 I heard an interview with Karen Thompson Walker, author of The Age of Miracles and was immediately intrigued. The premise of her novel sounded fantastic – the earth’s rotation starts to slow, making the days and nights progressively longer. What would happen? How would people react? Walker tells her story through Julia, an eleven-going-on-twelve middle school girl who finds herself lost and lonely at the start of the “Slowing.” Julia loses her best friend – ultimately caused by the slowing – and struggles to cope with changes at school and at home. I wanted to be swept away, and I wanted to care about Julia. But I found myself distracted by Walker’s language and word choice. Peculiar metaphors did nothing to elucidate the character’s feelings. There were endless repetitions of “I remember” and “that was the last time I saw or did x.” Then there were the carefully crafted phrases that made me think Walker was hoping to make the next edition of Bartlett’s. When I wasn’t distracted by the text, I realized that this was a fairly traditional coming of age tale, and there’s nothing wrong with that. We need to hear these stories. The journey of growing up is a journey we all take, and hearing a fictional tale about growing up can help us process our own experience. Through the lens of Walker’s imaginative setting, Julia’s life journey unfolds. I felt that Walker’s catastrophe “The slowing” was fascinating in its ramifications. The death of all plant life, the erosion of the earth’s magnetic field, the birds dying en masse and people suffering from “gravity sickness” are all part of the slowing. But frankly, any sort of disaster could have been the catastrophe that compels Julia to tell her story. I was also disappointed in Julia’s development. She’s a lonely girl at the start of the book, and seems to be a lonely woman at the end. While she shares a special friendship with Seth Moreno, at the conclusion of the story, I don’t think Julia was changed by this friendship. In fact, I don’t think Julia changes much at all, which is a shame. The melancholy girl without confidence or hope has become a woman without much hope whose mother says that she dwells too much on the past. While I was not wowed by this book, I do enjoy a genre bending novel that stretches your genre muscles. Science fiction, dystopia, family drama, and middle school angst – this novel defies classification. Solaris by Stanislaw Lem is an old fashioned scifi classic. Old fashioned in a Star Trek sense, with scientists in spacesuits, traveling to new planets. In this case, the planet is Solaris, a planet with 2 suns and an “ocean” comprised of an unknown morphing substance. Earth’s scientists have devoted decades of study to this planet and ocean, developing an elaborate classification system of the ocean’s ever changing formations. Research into Solaris is stagnant, until the latest expedition tries an unauthorized experiment – bombarding the ocean with highly powered X-rays. Finally, the scientists have attracted the attention of the ocean, which appears to be sentient, intelligent, and until now, completely uninterested in the human expedition. Kris Kelvin arrives on Solaris just after this experiment. After arriving on the research station, he wakes up to find his dead wife, Rheya with him. Rheya committed suicide years ago, after a quarrel with Kelvin, and seeing her changes Kelvin’s approach to Solaris. Each scientist on Solaris has a visitor, someone important to them towards whom they feel love, guilt, and responsibility. The visitors are discovered to be comprised of neutrinos, manifested by the ocean. What is the ocean’s purpose? Is it curious or hostile? Is it performing an experiment of its own? This novel raises a host of questions regarding experimentation and ethics, sentience and responsibility. Pondering these questions is fascinating – and helps alleviate some of the tedium of the narrative. Lem lets the novel get bogged down in lengthy discussions of the oceanic formations and the scientific theories regarding Solaris. Even with the overly detailed descriptive passages about the ocean and the history of the scientists – called Solarians – this novel is worth reading. It brings to the reader’s attention a question that we really need to think about: when and if humans encounter alien intelligence, will we recognize it? And – even more frightening – will that intelligence recognize us? Do you have a fellow author you mentor? Are you writing them letters? How about children, aunts, cousins, high school friends, teachers – do you sit down and write them a letter once in a while? I have just finished reading Letters by Kurt Vonnegut, edited by his friend and fellow author Dan Wakefield. I feel like a door has been opened into the mind and life of Mr. Vonnegut, and my impression of the man and his writing has been utterly changed and deepened. I guess I had always assumed that Kurt Vonnegut was probably most like his character Kilgore Trout, the strange and stoically unsuccessful scifi author that is featured in many of Vonnegut’s novels. Instead, I have come to know a man who cared passionately about his family – including his former wife Jane. He kept up a correspondence with many other writers, especially the authors he met while teaching at the Iowa Writer’s Workshop. His encouragement and advice to these writers continued from the time he met them in the late sixties, all the way up until his death in 2007. He also wrote to his teachers, army friends, and kept up a lifelong correspondence with friends from his high school in Indianapolis. Vonnegut also felt very strongly about censorship and free speech. There are quite a few letters in this collection, previously unpublished, sent privately to the towns and school boards that proposed banning his works from their libraries. That’s not to say that Vonnegut doesn’t get a bit testy, a la Kilgore, from time to time. Difficulties with his agents and lawyers are documented in his letters. It’s comforting to know, from editor Wakefield’s notes, that Vonnegut did resolve his estrangement from his long time agent and they resumed their friendship. We knew each other’s work, but had never met. Bingo! There we were face-to-face at last, at suppertime in my living room. Wakefield has grouped the letters by decade, and has written an introductory note to each section that frames the major events in Vonnegut’s life during that period. This was very helpful. However, there were a few significant letters – most obviously, the angry letter Vonnegut wrote after discovering that his second wife is having an affair – that Wakefield never addresses in his notes. Unless I read a biography of Vonnegut, I’m not going to learn the context of that letter. Also, Wakefield did some editing of the body of the letters, for understandable reasons, removing addresses, phone numbers, and repetitions. However, his explanation for his edits appears in the afterword. I ended up baffled by the ellipses at the beginning, and searched through the book to find Wakefield’s explanation at the back. I do think that would have been better placed at the beginning of the collection. A letter, written just for a specific person, conveys so much more of the writer’s personality than anything written for general public consumption like a blog post. And I do believe that the act of putting pen to paper makes a writer feel responsible to write something with thought behind it, unlike the many quick emails we dash off on a daily basis. So all of you wonderful writers that I have addressed this review to, please, do your fans a favor and write some letters. Not emails, not blog posts, but real, honest to god, written thoughtfully on paper, LETTERS. I received a copy of this book through a Goodreads giveaway. May I introduce you to the book that took me three weeks to read? 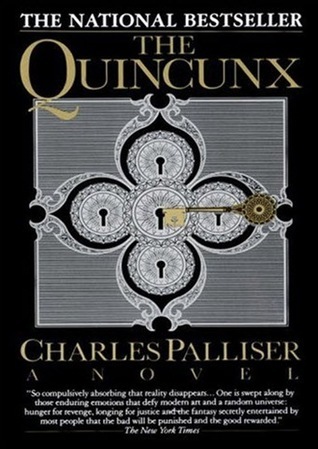 The Quincunx by Charles Palliser is a hefty doorstop of a book, weighing in at 787 pages in the 1989 edition. It’s big book, almost 3 pounds of paper. It’s not just big in a physical sense. It’s an ambitious work that was a first novel for Palliser, a bestseller and winner of the Sue Kaufman Prize for First Fiction (source: Wikipedia). The plot is intricate, the settings are naturalistic, and the characters entertaining. This novel is frequently compared to the works of Charles Dickens, and it’s easy to see why. The main character, who tells most of the story, is John Huffam, a plucky boy who is the hidden heir to a rich estate in the English countryside. A complicated estate entail, a missing will, and a strange codicil to this will have led John’s mother to hide him away in the countryside, living under an assumed name. One day, their home is burgled, disrupting this quiet anonymous life, and setting into motion a series of events that change their lives forever. John and his mother escape to London after their small fortune is swindled away by their enemies, and they spiral into a life of poverty and ruin in the London slums. After John’s mother passes away, tragically, John must fend for himself. John is frequently an unwitting pawn of his enemies, but sometimes the instigator of plots and plans himself. The missing will is a central plot point, and John goes undercover at the home of the current estate holder, the Mompessons, working as a scullery boy in order to discover the will’s hiding place. John solves a puzzle – in the shape of a quincunx – and recovers the will. Which is then lost again, through deception. Another key plot piece is the murder of John’s grandfather. Who actually killed the old man? Was there a plot, or was it just madness? The novel is wonderfully complex, and can be difficult to follow. About halfway through the novel, I realized that my complete understanding of the plot and what John believes about the plot were not necessary to enjoy the novel. After all, every time I (or John) had the family relationships figured out, or realized who it was that wanted John dead, new information was revealed that made my understanding false. After this happened a few times, I set aside my strong “need to know” and just enjoyed the plot turnings. Palliser divided this novel into five parts (like a quincunx), each named for a different branch of the intertwined families. With each section, there is a genealogical chart. As the novel progresses, the chart becomes more detailed in each section. It’s a wonderful piece of detail that I really enjoyed, and used to help my developing understanding of the relationships. The maps of London, also included at the beginning of each section, were also interesting and a great reference while reading. Like Dickens’ novels, The Quincunx features a plucky orphan finding his way, shady London villains, and many happy – or unfortunate – coincidences. And like Dickens’ novel Bleak House, The Quincunx features a will destined for Chancery Court. In my opinion, Palliser has out-Dickens old Boz in this novel. The plot is complicated to the point of absurdity. The villain Barney Digweed makes Bill Sykes look tame, and the put upon and ruined Miss Quilliam, is more desperately used than any Nancy. So while Palliser has taken these elements so familiar to the novels of Dickens – the orphan, the inheritance, the villains – and taken them to the next level, I don’t think he is fully parodying Dickens. Palliser’s tone is always sincere, even in the pompous omnisciently narrated sections of the novel. Palliser has created a gentle parody, that is more of an homage to Dickens than any kind of satire. Reading a novel like The Quincunx was a commitment. I am the kind of reader that usually has a few books going at the same time, but to fully appreciate this book I had to suspend that practice for a while and just focus on this novel. I would recommend this very highly to fans of Dickens – and recommend it less so if you are not a fan.